A new disease has swept across the country and promises to change the way many of us will garden. 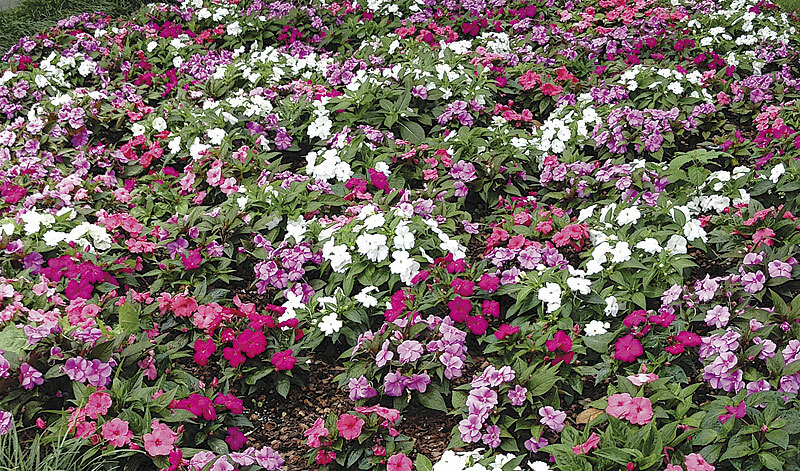 Impatiens downy mildew has found a way to dethrone the most popular bedding plant in the U.S. Downy mildew first appeared in England around the beginning of the 21st century. It showed up in California in 2004 and limited areas of the South in 2009. Here in Michigan in 2012, impatiens that were thriving one week were defoliated and nearly dead a week later. 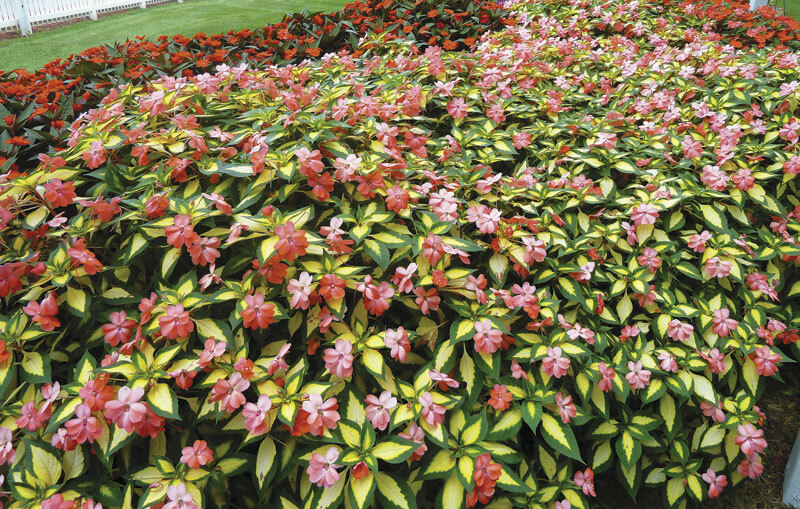 Regular, seed-grown impatiens (Impatiens walleriana) are the victims of this rampant disease. In the early phase, the leaves yellow and curl. If you turn the leaves over, you will clearly see the downy mildew (white powdery spores) on the underside. In the late phase, plants completely defoliate within a couple weeks. The disease produces spores that can move in the air and overwinter in the soil. Even if you didn’t have downy mildew last year, it is very likely that you will have it this year. Growers can apply specialized fungicides that will protect impatiens for up to 6 weeks, but there is no cure once the plants are infected. It is unpractical for the home gardener to try treating the disease since these chemicals need to be applied frequently by a certified applicator. Many commercial growers have chosen not to offer regular or double impatiens (Impatiens walleriana) this season. The good news is that we have so many great alternatives, including New Guinea impatiens (Impatiens hawkeri), that can perform beautifully where we used to grow regular impatiens. We will discuss many alternatives in this special three-part series. You’ll see that this disease has created an opportunity for gardeners to try several interesting and potentially rewarding candidates. Traditional New Guinea impatiens are grown from cuttings (i.e. vegetatively propagated). This type of impatiens will thrive in partial sun locations. In full shade, they will flower sparingly. In full sun, they will flower more heavily, but they will also require frequent watering in hot, dry weather. 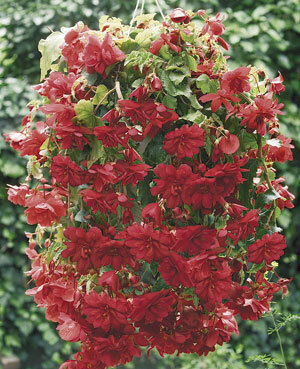 These are commonly sold in hanging baskets but they are also readily available in 4-inch pots. Some growers will be offering them in flats of 18 this spring. 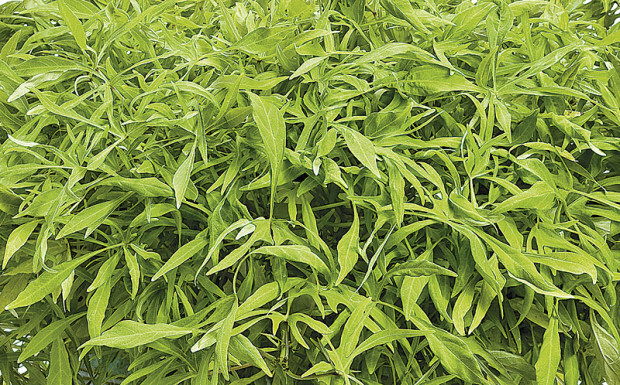 Plant these on 10- to 14-inch centers for good coverage in bedding applications. They come in an infinite range of colors. Like regular impatiens, they are self-cleaning and low maintenance. Divine New Guinea impatiens are seed-grown New Guinea impatiens. Why does that matter? 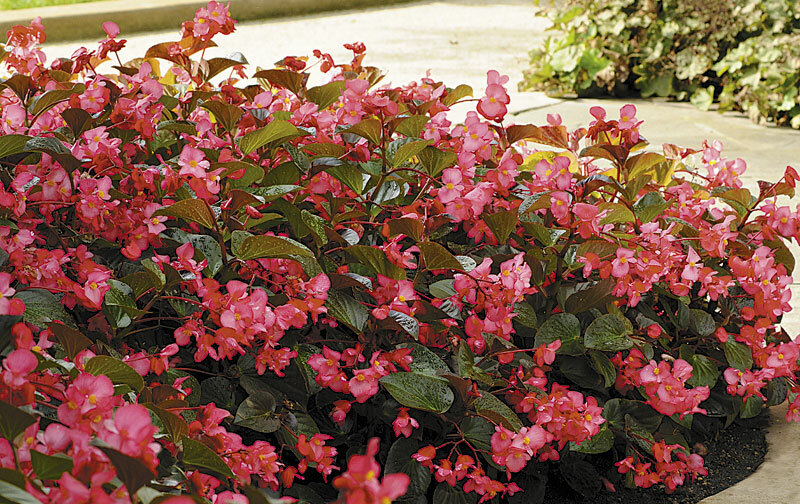 They are the only impatiens that might be available this spring at the lower cost of traditional impatiens. They perform similar to traditional New Guinea impatiens but perhaps with slightly less vigor. They grow 10 to 14 inches tall and can spread 12 to 14 inches. There are currently 6 individual colors and 5 different mixes. More colors will be available in 2014. SunPatiens are hybrids of traditional New Guinea impatiens with extraordinarily heat-tolerant leaves, petals, and root systems. The SunPatiens family consists of 3 distinct series. The Compact series (10 varieties) can grow 24 to 36 inches tall in beds or 18 to 24 inches tall in containers. 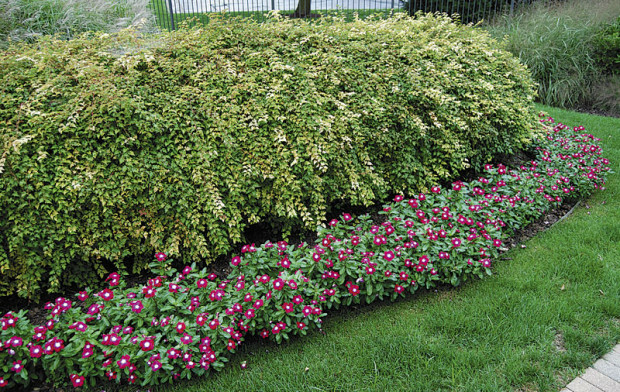 Just like regular impatiens, more water and fertilizer will increase height. SunPatiens’ vigor is a bonus since fewer plants can be planted per square foot, and therefore less labor is required for the installation. These can be planted 14 to 20 inches apart to create floriferous, mass displays in either sun or shade. 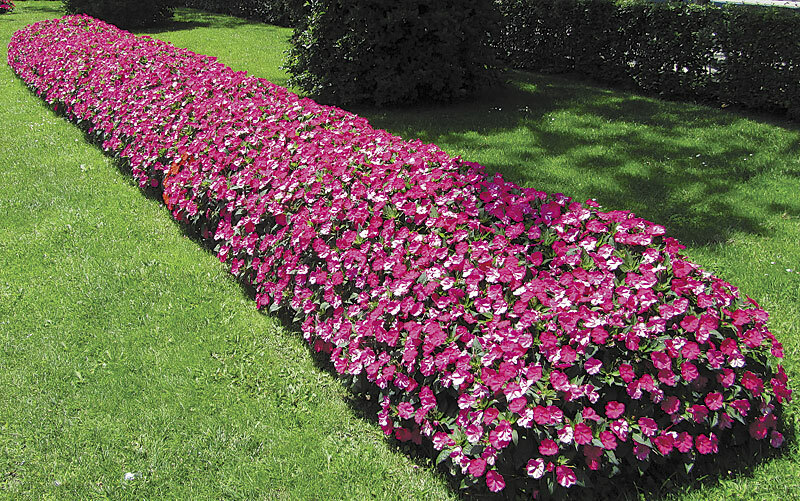 The Vigorous series (8 varieties) can grow 36 to 48 inches tall and equally wide. They are not recommended for containers. 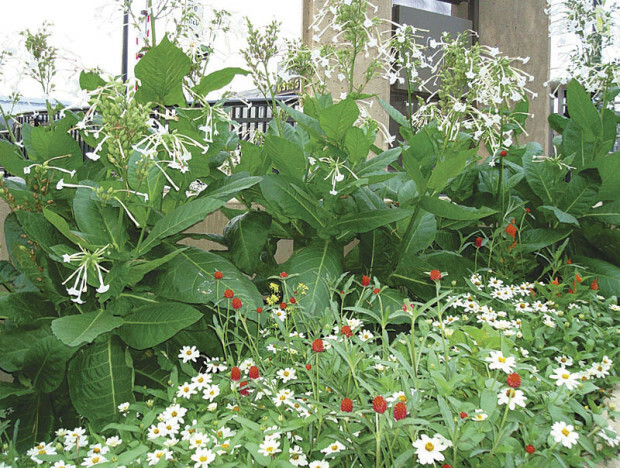 The Spreading series (5 varieties) can grow 30 to 40 inches tall and 32 to 36 inches wide in the garden. This one is a good choice for larger containers. SunPatiens are typically available in 4- to 6-inch pots, but some growers will be offering them in more economical flats. 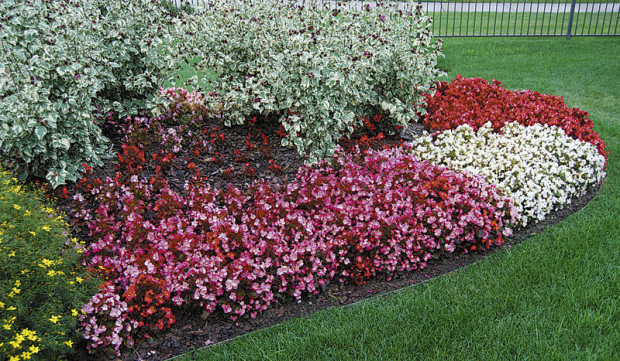 In terms of performance, SunPatiens are arguably the most effective impatiens replacement if your site can accommodate taller plants. 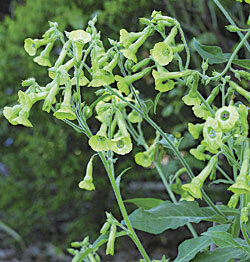 Nicotiana (tobacco flower) prefers full to part sun but will also tolerate shade. 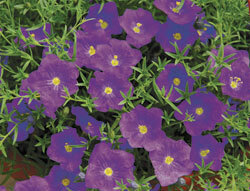 These produce clusters of small, petunia-like flowers in colors including white, pink, purple, green, rose, and red. 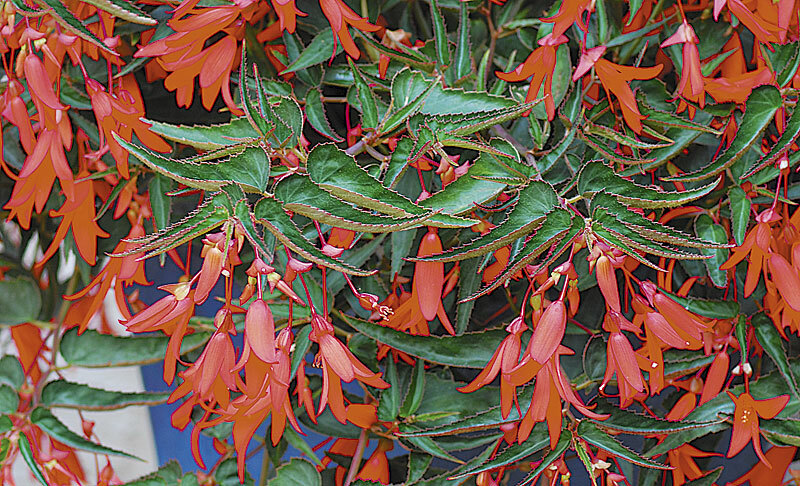 They are especially fragrant at night and are often considered one of the most desirable hummingbird plants. The ‘Perfume’ series has received several awards, boasts a broad color range, and produces relatively large flowers on plants growing 18 to 24 inches tall. The ‘Whisper’ series has even better heat tolerance, with flowers in pink shades growing 24 to 36 inches tall. The tall white nicotiana (Nicotiana sylvestris, 3 to 4 feet tall) and the tall lime-green nicotiana (Nicotiana langsdorffii) are great additions to annual or perennial beds. Fuchsia. Most gardeners think of hanging plants when they think of fuchsias. There are hundreds of wonderful fuchsias that thrive in lower light conditions and cascade beautifully in hanging baskets or patio planters. But there are a few bedding type fuchsias whose upright growth habit makes them ideal for use in beds as well—in either shade or sun. The most common upright fuchsia is ‘Gartenmeister,’ which usually grows 2 to 3 feet tall. 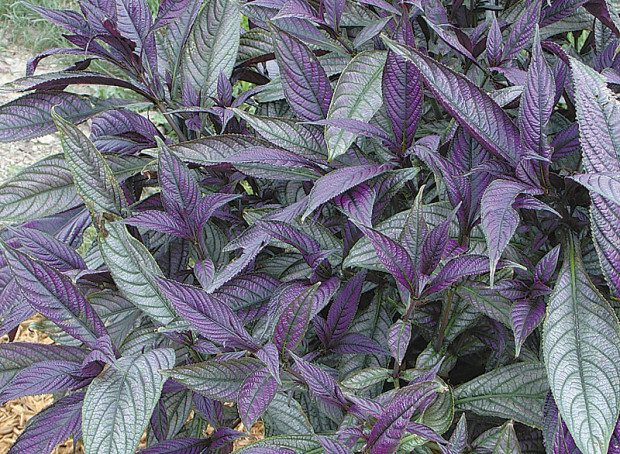 Its purple-veined, reddish-brown leaves are beautiful and the orange, tubular flowers attract butterflies and hummingbirds. ‘Firecracker’ has tricolored leaves of pink to violet, green, and white with orange tubular flowers. It is fantastic all by itself but looks great with other companions. It is less vigorous than ‘Gartenmeister.’ ‘City Lights’ and ‘Electric Lights’ are award-winning, upright growers that flower in sun or shade all summer long. The ‘Lights’ series grows to about 2 feet tall and is very underused. There are other upright fuchsias currently available, but these 4 cultivars have proved to offer the best performance in perennial beds, annual plantings, and containers. Nierembergia (cup flower) is one of my favorite underused annuals, and is wonderful in pots or beds. 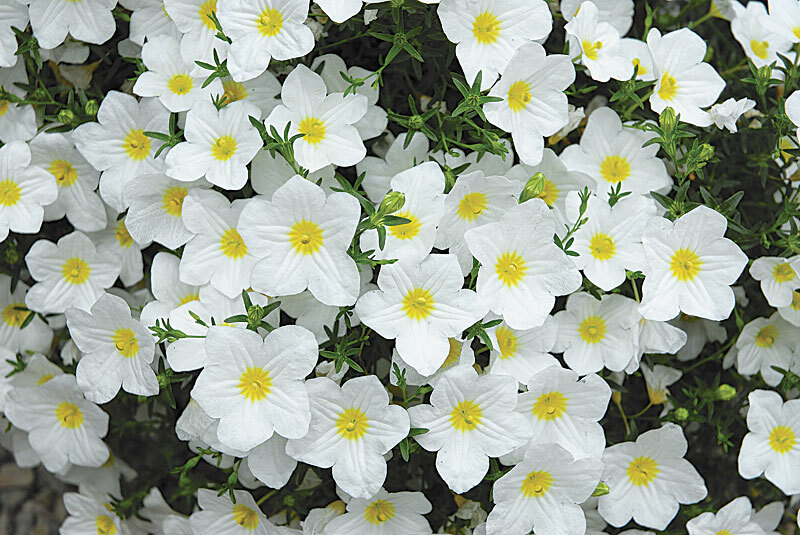 It will grow in full sun or shade and produces a spreading mound of white or blue, upward-facing, “cup”-shaped flowers with tiny yellow centers. 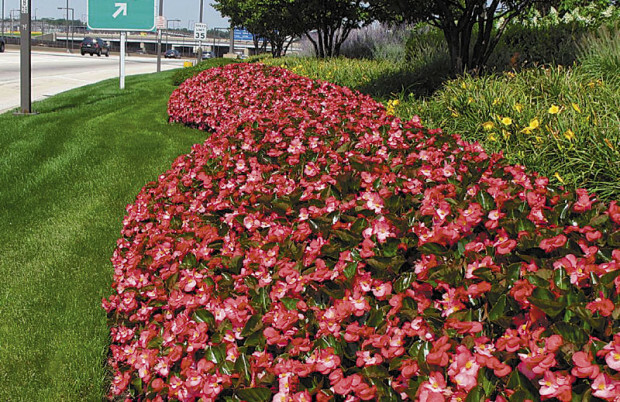 It requires no deadheading and has great heat tolerance. The best nierembergia is the ‘Lara’ series, which has ‘Lara White’ and ‘Lara Blue.’ They are propagated vegetatively and thus are typically sold in pots. They grow 8 to 10 inches tall and about the same width. 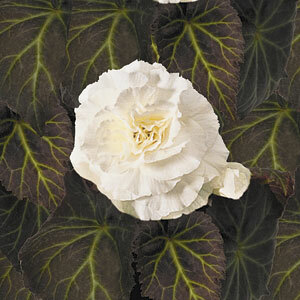 Traditional wax-leaf begonias are available everywhere and offer an inexpensive alternative for either sun or shade. Choose from bronze or green foliage and standard colors of red, white, light pink, dark pink (rose), or mixed. Both foliage colors will tolerate full sun as long as the foliage remains dry when the sun is shining. 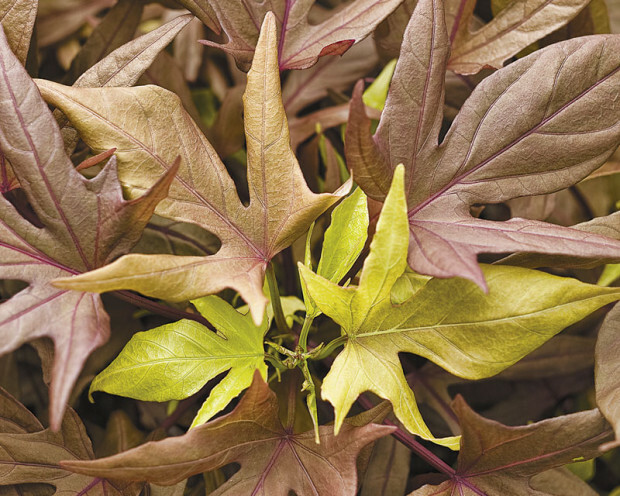 Green-leafed varieties (except those with white flowers) will develop a pink/red tint when exposed to full sun. They typically grow 8 to 12 inches tall. 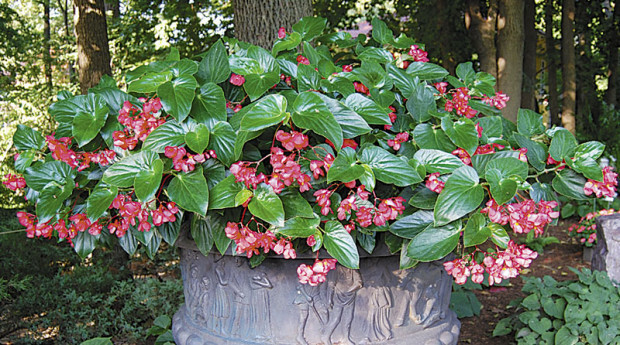 Wax-leaf begonias require no deadheading and thrive with minimal watering. Dragon Wing begonias have been around since the late 1990s. True Dragon Wing begonias are only available in red and pink. Their unique arching, semi-pendulous habit makes them ideal for hanging baskets, large containers, or beds. Use these in shade to part shade where plants will flower effortlessly with minimal care. They can grow 12 to 15 inches tall and 15 to 18 inches wide. They are seed-grown and should be available in 4- to 6-inch pots and sometimes 18-count flats. Wax-leaf begonia hybrids. These have become very popular the past several years with the introduction of several outstanding varieties. The ‘Big’ series boasts flowers up to 3 inches across! There are 3 varieties: ‘Big Red with Green Leaf,’ ‘Big Red with Bronze Leaf,’ and ‘Big Rose with Bronze Leaf.’ They can grow over 2 feet tall and perform beautifully like the traditional wax-leafed begonias. A newcomer on the garden scene is the ‘Whopper’ series. It will grow almost 3 feet tall and 22 inches wide. It also has 3-inch, red or pink flowers and comes with a bronze or green leaf. There is also a little-known series of double-flowering, wax-leafed begonias called ‘Fairytale.’ The mostly double flowers are held well above the green leaves and come in red, pink, white, coral picotee, and mixed. This series is seed-grown and may be available in flats. Tuberous begonias. Tuberous begonias that are grown from tubers are still available, but cost and availability has made them less and less popular. 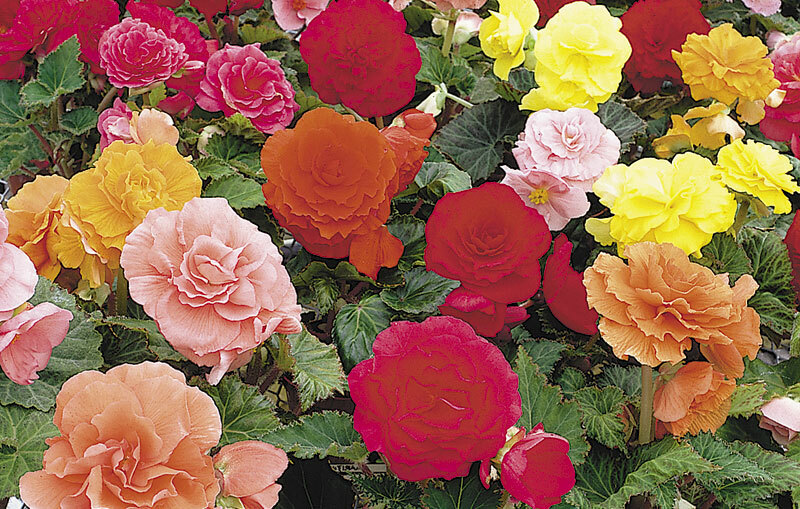 Most tuberous begonias sold today are grown from seed. 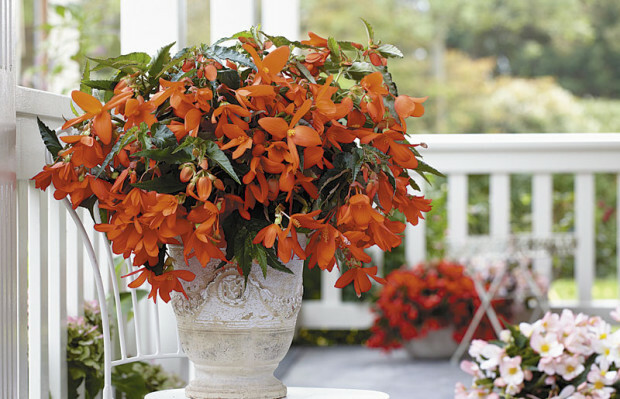 The most popular seed-grown series is the ‘Nonstop’ begonia. It is an upright grower with large, double flowers and green leaves. The color range includes yellow, orange, pink, rose, salmon, red, white, appleblossom, and several others. They are extra happy in a well-drained potting soil but will also grow in the ground in beds. There is a bronze-leafed series called ‘Mocca’ that is identical to the ‘Nonstops’ except for its darker, brownish foliage. For a trailing series, try ‘Illumination,’ whose mostly double flowers cascade from arching plants. These are perfect for hanging baskets or containers—alone or in combination with other shade lovers. There are many individual colors and some exceptional bicolor varieties such as ‘Peaches & Cream’ and ‘Golden Picotee.’ Keep the soil slightly moist and fertilize through the summer. 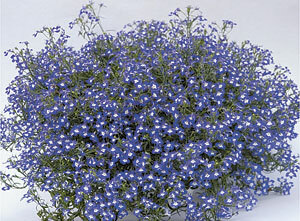 Lobelia is available in seed-grown flats or vegetatively-grown pots. The seed-grown varieties decline rapidly as temperatures increase. By summer they are usually quite brown and inevitably discarded. However, the vegetatively-grown varieties have much better heat tolerance, especially when protected from midday sun. They have a mounding to trailing habit and come in shades of blue, white, and pink. The most heat-tolerant ones are the ‘Hot’ series and the ‘Techno’ series. 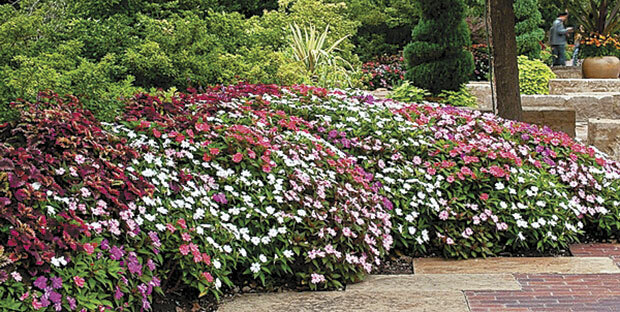 Being that they are not grown from seed, they are significantly more expensive than impatiens. Wishbone flower (Torenia) is available in seed-grown flats or vegetatively-grown pots. The seed-grown varieties include a relatively new series called ‘Kauai,’ whose performance in numerous field trials has been exceptional. This series offers more compact plants with superior branching in seven colors and a mixture. Choose from pinks, purples, blues, and whites. They form tight mounds 8 to 10 inches tall and wide that thrive in shade or partial shade. The vegetatively-propagated cultivars come in similar colors and thrive in shade to nearly full sun. The big difference is that these torenia have a trailing habit. They are great in hanging baskets or as a groundcover. They look great planted under red or pink Dragon Wing begonias. Vinca (periwinkle). Where some sun is available, this seed-grown bedding plant will thrive. As little as four hours of full sun will sustain good growth; even unobstructed northern exposure will suffice. 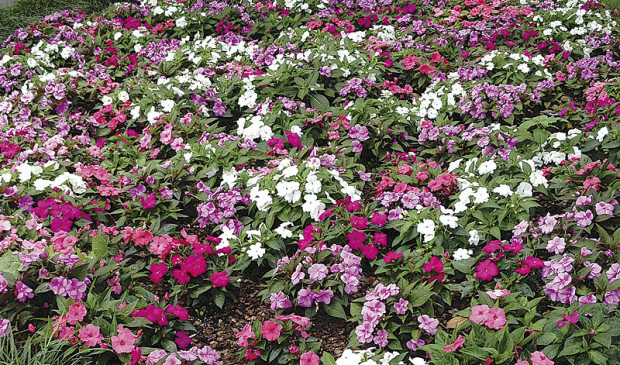 Vincas prefer acidic, well-drained soil that’s high in organic matter. They also prefer to be grown warm, so planting them too early in the spring could prove detrimental. They have a mounding growth habit and come in a broad range of colors. Today’s varieties have overlapping petals and extra large flowers that strongly resemble impatiens. Where enough light is available, this is an economically practical impatiens alternative. 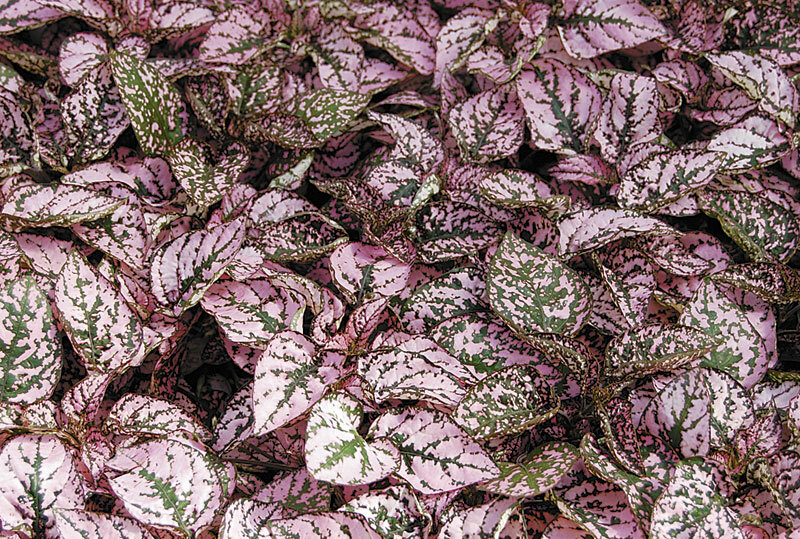 Coleus produce ornamental foliage whose diversity, beauty, and performance has turned this genus into one of the most popular bedding and container ornamentals. 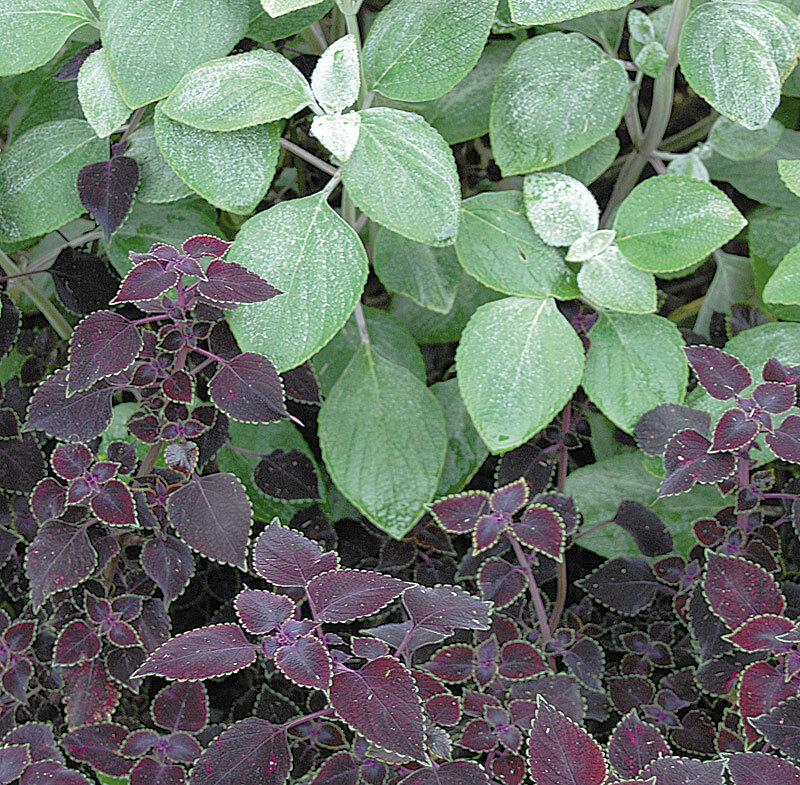 Coleus should be divided into two distinct groups. Seed-grown coleus are typically upright growers. There are several series, nearly all of which prefer shade to part shade. As these are seed-grown, they are more likely to develop into flowering plants in an attempt to produce seed. When flowering occurs, plant vigor drastically declines. So, the flowers must be continuously removed. There is a relatively new series called ‘Versa’ which sports seven different varieties. These are sun or shade tolerant, heat tolerant, and very late to initiate flower development. 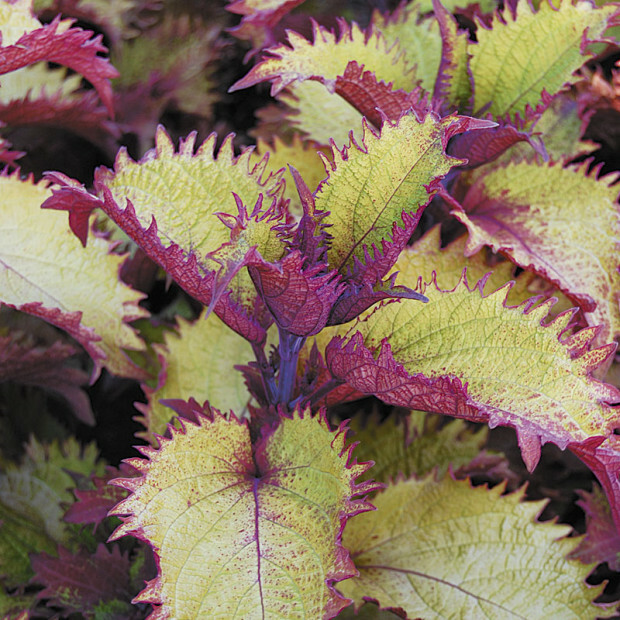 ‘Versa’ coleus have rated very high in North American trial gardens since they were developed a few years ago. 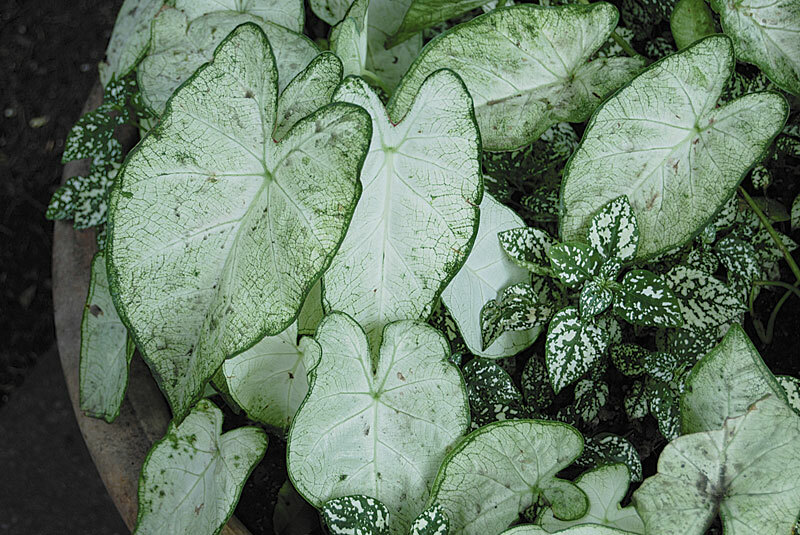 Caladiums make excellent accent plants in the shade. Some cultivars will also thrive in sun as well. They have beautiful, multicolored, veined leaves with colors like red, pink, white, yellow, and burgundy. They are ideal in containers where soil is generally well-drained, but also tends to be warmer. Caladiums dislike cold soil, especially cold and wet soil. They are grown from corms, which can be purchased and planted once the soil is warm. They can also be purchased in pots. Heights vary from just 6 inches to about 18 inches. 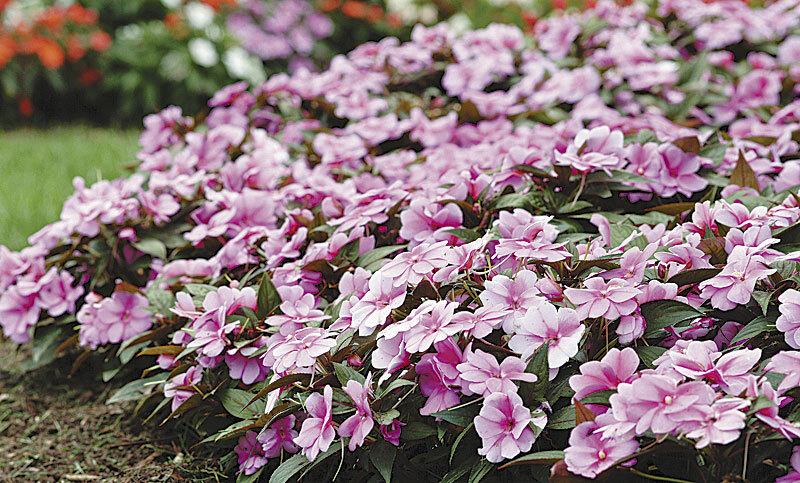 Being that they are not grown from seed, they are significantly more expensive than impatiens. Sweet potato vine (Ipomoea). This group of plants has become very diverse since the early 2000s. Originally there were simply yellow- and black-leafed varieties with heart-shaped leaves and exceptional vigor. These are still available but now we can choose from red, bronze, green, and bicolored, with either heart-shaped leaves or the “finger”-leafed type (a more dissected leaf pattern). We also have more compact forms such as the ‘Bright Idea’ series, the ‘Illusion’ series, and the chartreuse cultivar ‘Chihuahua.’ All grow effortlessly in beds or containers, in sun or shade. Keep in mind that the more vigorous types will likely require some pinching to keep them under control. Polka dot plants (Hypoestes) are seed-grown, foliage plants with leaves speckled green and pink, red, or white. They can be planted in mass to carpet the ground, but are most often used as a colorful foliage accent in small containers. Polka dot plants typically only grow 8 to 12 inches tall and wide. They are usually available in pots, but a few growers offer them in flats. Use polka dot plants in shade or nearly full sun. Golden creeping Jenny (Lysimachia nummularia ‘Aurea’). This perennial groundcover has become incredibly popular since the late 2000s. 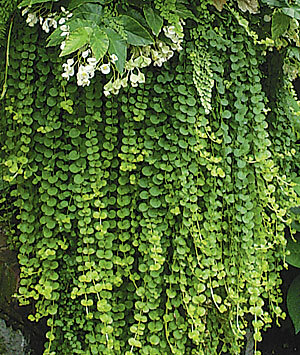 The small, round, waxy leaves hug the ground and cascade over pot edges. It is very vigorous and may require some pruning in containers, but is more likely to offend the unsuspecting gardener in beds where it attempts to “cover” the ground if not kept under control. Besides being adored by slugs, it is easy to grow in shade to part shade. It will perform well in sun if kept moist. Persian shield (Strobilanthes) produces spectacular metallic leaves of purple, rose, and green tones on two-foot tall, round bushes. It is rarely used in mass but rather as an accent in shady borders or large containers. I have seen it growing beautifully in full sun but it consistently shines in shade to part shade. It is exceptional with silver leaves (like plectranthus) and pink or blue flowers. Plectranthus. This diverse genus includes flowering plants, foliage plants, and even a few herbs. The more common bedding types are upright or cascading with silver, green and white, or green and gold leaves. All will grow in either sun or shade in beds or containers. Be sure to know what you are buying, as many of the upright and cascading types look quite similar when immature. The flowering plectranthus, such as ‘Mona Lavender’ and ‘Velvet Elvis,’ are beautiful, violet-blue flowering plants in the spring and fall (late September). Like mums, they only flower when the days are short. The velvety green leaves have purple undersides and remain attractive through the summer when the mounding plants are flowerless. These prefer part sun for the best flowering and grow to about 12 to 24 inches tall. Purple heart (Setcresea). This versatile plant is very durable. It tolerates poor soil, heat, dry or wet conditions, and sun or shade. It makes a beautiful underplanting for orange or yellow flowers but also looks great alongside blues and pinks. 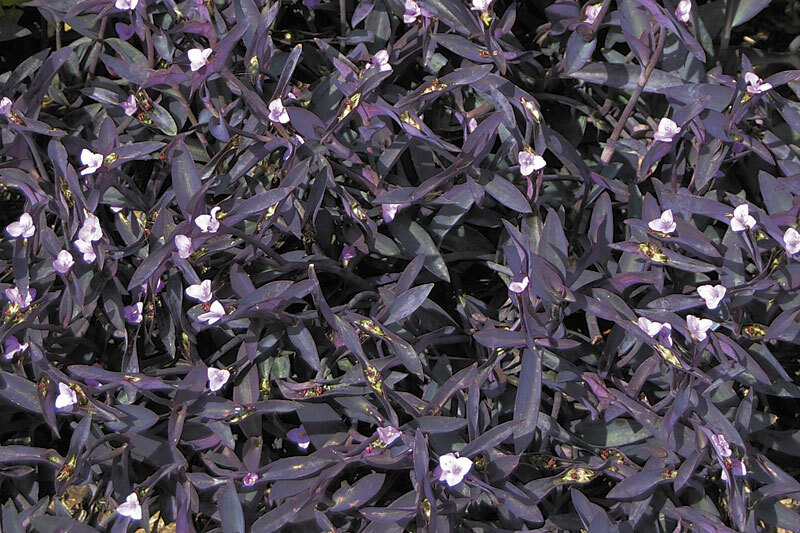 Purple heart is popular in containers, but has been underused in beds. It can grow to about a foot tall by the end of the season. George Papadelis is the owner of Telly’s Greenhouse in Troy, MI.